Showing results for tags 'cds'. Good morning everyone. I have been plagued by this issue for over a year now. There is a system out there called CDS. I did not know about it until an avatar who owned a sandbox group and I had a disagreement and she and her sandbox members all began to grief me. They didn't eject me from their group, they just disabled my ability to chat in it while they talked about me and for the next few days harassed me in IMs. One of the points in their harassment was to claim that suddenly, just then, the CDS on their sim detected I was using 3a blacklisted viewer, but I have always only used firestorm and I was not even on their sim. They then said that I was now banned from a lot of other sims automatically and forever and claiming to many others that I was a content thief. I have been in SL since 2005 and never have I done anything like this. I thought they were just trying to get at me as I've never had any problem getting to any stores or sims. However, it turns out they did something to put me in this system. I have appealed through the CDS website multiple times for over a year now and it turns out they have special connections to the CDS system and had me banned unjustly, but CDS will not respond to my appeals. I cannot go to some stores as I am automatically and temporarily banned from them the moment I arrive because of this system. How is this not a form of griefing? I've heard that others had to contact Linden Labs to prove they have never used a blacklisted viewer. How can I do this? Occasionally, when these people see me, they still harass me with "What's it like being banned from 1500 stores?" or "Can you recommend a good copybot to me?" This has gone on long enough. Who should I go to about this? I have never used anything but firestorm. Before that I used phoenix. Before that I used Emerald and before that I used SL viewer. I have screenshots to prove all of this and I did report them many times before when this all started. Come be a part of our well established community of the Confederation of Democratic Simulators. Alpine Meadow provides an easy alpine lifestyle full of sloping hillsides, trees, bubbling mountain streams and domestic and wild animals. Considerable common land buffers many of the parcels. Alpine Meadow parcels are double prim. Parcels tend on the larger side for the estate, but there are parcel sizes to suit every taste and pocketbook. Some of the available midsize parcels are: CS1 Alpine Meadow, L$3484 monthly tier, 1024 sq.m., 624 prims CS2 Alpine Meadow, L$3484 monthly tier, 1024 sq. m., 624 prims CH4 Alpine Meadow, L$3484 monthly tier, 1024 sq.m., 624 prims Our estate consists of six regions that have loosely based Germanic, Tuscan, Alpine, and Mediterranean themes, representing different historical periods. The CDS is not a role-playing community. All are welcome to visit, explore, and become a part of our dynamic community. Land ownership in the CDS means citizenship, with the right to vote, run for office, and have a say in the direction and projects of the regions. Owning land in the CDS: we have a diverse selection of parcels to choose from in the six regions. If you want to set up a small home just to ‘test’ if you like it in our community, there are parcels available for as little as $1/US a month. If a sprawling mansion is more your speed, there are large rural parcels available within our beautifully landscaped regions that might just suit. Our covenants define the style of buildings allowed. This keeps the region themes intact and creates a contiguous continent that is pleasant to travel around in, with spectacular views and many public spaces for the use of citizens. Just ask any one of our Estate Managers for assistance in finding the parcel that fits your needs. We are always happy to help. Check the list of available land. We have many parcels of different sizes to accommodate any budget or level of interest. See actual land prices inworld via Land Tools. All tier(rent) is monthly. The purchase price represents your first 30 days of tier. The CDS was established in 2004 and is the oldest estate in Second Life owned and democratically governed by its residents. Come be part of the tradition. We have fun too. For more information about our community, visit our portal, or Facebook. Come be a part of our well established community of the Confederation of Democratic Simulators. This lovely riverside parcel allows views of our meandering river, our spectacular mountain and the old City of Colonia Nova. R.03 Colonia Nova - L$4328 monthly tier, 2416 sqm, 737 prims Our estate consists of six regions that have loosely based Germanic, Tuscan, Alpine, and Mediterranean themes, representing different historical periods. The CDS is not a role-playing community. All are welcome to visit, explore, and become a part of our dynamic community. Land ownership in the CDS means citizenship, with the right to vote, run for office, and have a say in the direction and projects of the regions. Owning land in the CDS: we have a diverse selection of parcels to choose from in the six regions. If you want to set up a small home just to ‘test’ if you like it in our community, there are parcels available for as little as $1/US a month. If a sprawling mansion is more your speed, there are large rural parcels available within our beautifully landscaped regions that might just suit. Our covenants define the style of buildings allowed. This keeps the region themes intact and creates a contiguous continent that is pleasant to travel around in, with spectacular views and many public spaces for the use of citizens. Just ask any one of our Estate Managers for assistance in finding the parcel that fits your needs. We are always happy to help. The CDS was established in 2004 and is the oldest estate in Second Life owned and democratically governed by its residents. Come be part of the tradition. We have fun too. Come be a part of our well established community of the Confederation of Democratic Simulators. The Valley of Neufreistadt offers a tranquil, rural lifestyle in the shadow of the old City of Neufreistadt. Neufreistadt is among the oldest private islands in Second Life. Originally named Neualtenburg, this region has been the center of the democratically governed and resident owned estate of the Confederation of Democratic Simulators. Owning land in this venerable estate is your opportunity to further the long history and tradition of this experiment in virtual governance. The Valley of Neufreistadt is also just a beautiful location for your Second Life home. Currently, there are two parcels available: P170 Neufreistadt, L$2607 monthly tier, 1456 sq.m., 444 prims P140 Neufreistadt, L$1347 monthly tier, 752 sq. m. 229 prims Our estate consists of six regions that have loosely based Germanic, Tuscan, Alpine, and Mediterranean themes, representing different historical periods. The CDS is not a role-playing community. All are welcome to visit, explore, and become a part of our dynamic community. Land ownership in the CDS means citizenship, with the right to vote, run for office, and have a say in the direction and projects of the regions. Owning land in the CDS: we have a diverse selection of parcels to choose from in the six regions. If you want to set up a small home just to ‘test’ if you like it in our community, there are parcels available for as little as $1/US a month. If a sprawling mansion is more your speed, there are large rural parcels available within our beautifully landscaped regions that might just suit. Our covenants define the style of buildings allowed. This keeps the region themes intact and creates a contiguous continent that is pleasant to travel around in, with spectacular views and many public spaces for the use of citizens. Just ask any one of our Estate Managers for assistance in finding the parcel that fits your needs. We are always happy to help. Check the list of available land. We have many parcels of different sizes to accommodate any budget or level of interest. See actual land prices inworld via Land Tools. All tier(rent) is monthly. The purchase price represents your first 30 days of tier. The CDS was established in 2004 and is the oldest estate in Second Life owned and democratically governed by its residents. Come be part of the tradition. We have fun too. For more information about our community, visit our portal, or Facebook. 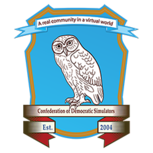 Come be a part of our well established community of the Confederation of Democratic Simulators. These fine country cottage townhouses offer ready to move in ease in a beautiful alpine region. The area is close to the region edge and rather low lag. Alpine Meadow parcels are double prim. Currently, there are three of these parcels available: DT1 Alpine Meadow 512 sq. m. - 312 prims, L$1749 monthly tier DT2 Alpine Meadow, 512 sq. m. - 312 prims, L$1749 monthly tier DT3 Alpine Meadow, 512 sq. m. - 312 prims, L$1749 monthly tier Our estate consists of six regions that have loosely based Germanic, Tuscan, Alpine, and Mediterranean themes, representing different historical periods. The CDS is not a role-playing community. All are welcome to visit, explore, and become a part of our dynamic community. Land ownership in the CDS means citizenship, with the right to vote, run for office, and have a say in the direction and projects of the regions. Owning land in the CDS: we have a diverse selection of parcels to choose from in the six regions. If you want to set up a small home just to ‘test’ if you like it in our community, there are parcels available for as little as $1/US a month. If a sprawling mansion is more your speed, there are large rural parcels available within our beautifully landscaped regions that might just suit. Our covenants define the style of buildings allowed. This keeps the region themes intact and creates a contiguous continent that is pleasant to travel around in, with spectacular views and many public spaces for the use of citizens. Just ask any one of our Estate Managers for assistance in finding the parcel that fits your needs. We are always happy to help. Check the list of available land. We have many parcels of different sizes to accommodate any budget or level of interest. See actual land prices inworld via Land Tools. All tier(rent) is monthly. The purchase price represents your first 30 days of tier. The CDS was established in 2004 and is the oldest estate in Second Life owned and democratically governed by its residents. Come be part of the tradition. We have fun too. For more information about our community, visit our portal, or Facebook.